Founded in 1850, ArtCarved strives to create beautiful, customized jewelry that lasts for years and helps you remember the special moments in life. Pieces range from engagement rings and wedding bands to fashion jewelry colored with vibrant gemstones. In addition to caring for their customers, ArtCarved cares for workers around the world and the global environment. Their memberships in both the Kimberley Process and the No Dirty Gold campaign influence the way they obtain their gold and diamonds. The brand is committed to providing exquisite fine jewelry while honoring the earth and its people. Several ArtCarved collections are timeless. These work well for the bride who sees her ring as a large investment and future family heirloom. In the Classic collection, simple solitaires are augmented by pavé bands, slightly open shanks, and delicate twists. Many solitaires also feature a sparkling collar of diamonds underneath their settings for shimmer and lift. 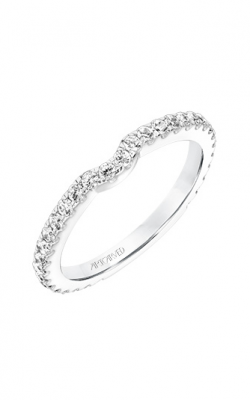 Halos give center stones the illusion of higher carat weight and spread. The Vintage collection offers updated takes on time-honored, iconic silhouettes. Intricately-shaped halos turn a simple round diamond into an ornate Art Deco masterpiece. Milgrain details frame the diamond studs along a contoured band. Other collections are a bit trendier. These styles may be more appropriate for a modern minimalist or a highly individualistic bride. The Contemporary collection features unconventional details like twisted rope halos, two-tone metal bands, and cable collars. The metal frames of the Bezel collection are slightly industrial. These minimal styles evoke up-to-date simplicity. Alternatively, a bride may use a blast from the past to stand out from the crowd. The Floral collection combines vintage petal settings with modern twisted and shaped shanks for a look that could take Instagram by storm. 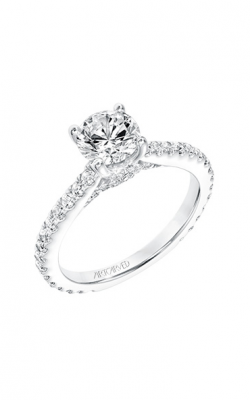 Why Shop for ArtCarved at Northeastern Fine Jewelry? Northeastern Fine Jewelry began as the Northeastern Coin Gallery in 1980. We have since grown to the greater Capital Region’s highest volume jeweler and top fine jewelry source. Over the past decade, our expansion has allowed us to open showrooms in Albany, Glen Falls, and Schenectady, NY. We offer top designer engagement rings, wedding bands, Swiss-made timepieces, GIA-certified loose diamonds, and fine fashion jewelry. For inquiries regarding our products, services, events, and hours, please visit one of our showrooms today. You may also browse our website or call 1-855-795-NEFJ.